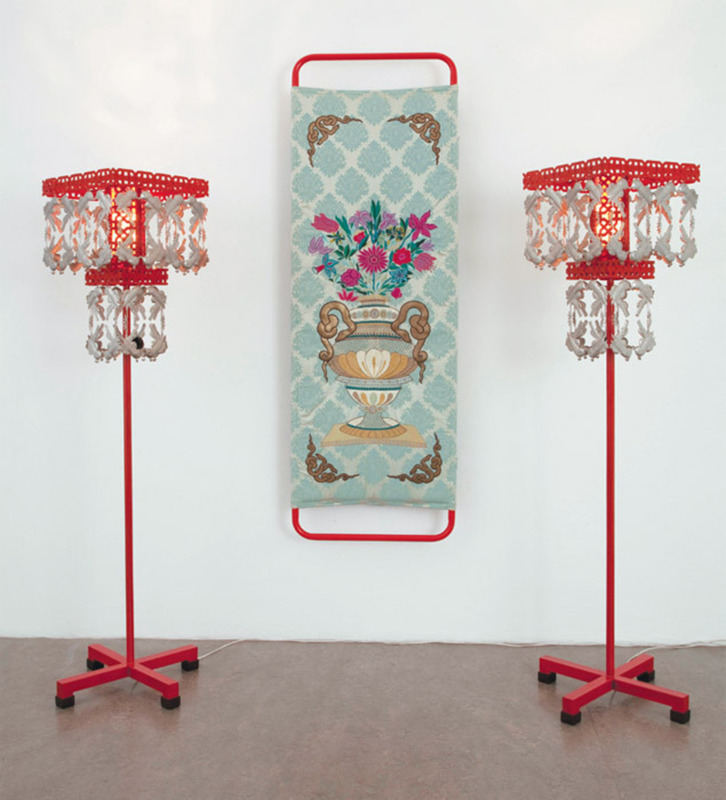 Adeela Suleman, Prying in her richly decorated room I, 2012, embroidery on canvas, iron, paint, lamps, 89 1/2 x 78 3/4 x 33 1/2". For her latest show, “I had no choice but to hear you,” Adeela Suleman exhibited six new works so richly decorated and visually sumptuous, they dazzled. In keeping with some of her earlier installations, these works incorporated steel elements, embossed and hammered like silver, affixed to iron supports. Three of the new sculptures, Red rain falling alone, Prying in her richly decorated room II, and Prying in her richly decorated room I (all works 2012), are variations on a theme. In these works, constructions resembling floor lamps are positioned a short distance from the wall. In the first case, the “lamp” is a solitary object, in the second it accompanies an embroidered fabric on the wall, while in the third it is doubled, framing, with perfect symmetry, a textile at the center.